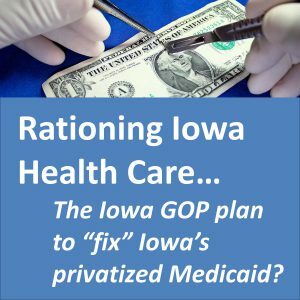 In the final days of the 2018 campaign, a Northwest Iowa State Senator may have mistakenly released the Republican Party of Iowa’s secret plan to “fix” the Medicaid privatization mess. During a forum last week sponsored by the Sioux City Rotary Club, State Senator Jim Carlin of Sioux City proposed rationing health care for Medicaid recipients. Carlin specifically said lawmakers should “look into limiting the number of doctor visits” by people on Medicaid. Throughout 2017 and 2018, Governor Reynolds and other Republican leaders acknowledged “mistakes were made” with Medicaid privatization, but they have offered no solutions for reversing course on a change that has turned over health care management for hundreds of thousands of Iowans to out-of-state corporations. Cut and delayed payments to Iowa health care providers that provide critical services to hundreds of thousands of Iowans. Made health care services even less accessible to Medicaid members. Shifted more than $100 million away from education, health care and public safety to cover the additional payments to out-of-state corporations. 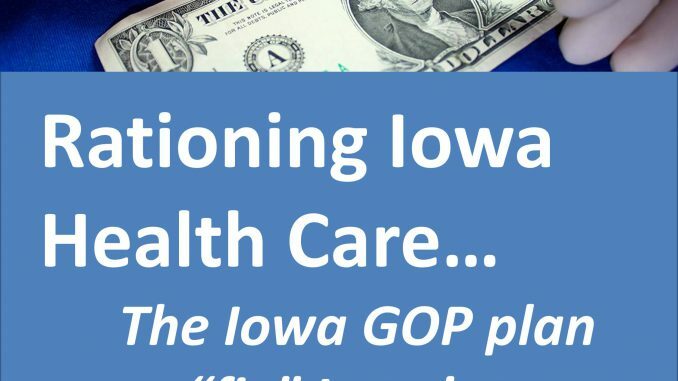 “Make no mistake about it, Senator Carlin’s plan would cost Iowa taxpayers more money in the long run and would further endanger the health and safety of Iowans,” Petersen said.